Welcome to the New Release post and Blog Hop showcasing projects from Our Daily Bread Designs July Release! You can see all of the July Releases here. Continue reading below to find out how you can win one of three $25 Gift Codes to the ODBD Website! I created a Double Z Fold card using the new Forever Friends stamp set, Layered Lacey Ovals, Ornate Ovals and Vintage Borders die sets along with a few previously released ODBD Dies and the Birthday Bash and Birthday Brights paper collections that were released last month. Below is a view of the card slightly opened. I paper pieced the Coneflower using the Birthday Brights paper collection, placing it on a White panel that was die cut using the Ovals die set, then layered onto a White panel die cut using the Layered Lacey Ovals set. This panel was layered onto the Espresso panel that was die cut using the Ornate Ovals die set, then layered onto the panel that was die cut using the Layered Lacey Squares. Here's another view of the card, on the smaller Z Fold, I have the larger panel tucked under pattern paper on the left hand side. The sentiment is Brown embossed on White card stock, die cut with the Vintage Label die set and layered onto an Espresso panel that was die cut using the Vintage Borders die set. Three randomly selected winners will each receive a $25 gift code to the ODBD Website just for commenting on the Design Team cards! You have until July 2, 2016 at 9:00 p.m. EDT to leave your comments. The Winners will be posted July 3rd, on Our Daily Bread Designs Blog, so be sure to check back there to see if you won! Beautiful way to show these new products! Love the fancy fold!!! I love the folding card! Thanks for showing us the finished product! Such an elegant Z fold card. Oh love that fancy fold Lisa!! Very cool and love the papers you used! This card is beautiful! I love the folds too. Gorgeous card! I love the fancy fold! Lisa, as always, your card is beautiful! Lovely colors and layout! WOW Lisa, this is lovely. A very elegant card. Very pretty fancy fold Lisa! Fabulous job paper piecing the cone flower!! Beautiful card, love the fancy fold! Thanks for sharing. The folding card is beautiful! Lisa, you are the queen of folds!! Love this one and will have to try it sometime soon!! Beautiful coloring and design! I love the card fold. And I think the use of the black makes the flowers stand out even more. Awesome cards. Love your beautiful fold card. pretty card, these flower stamps are so nice! How clever.. paper piecing the coneflower! Love the Z fold! This is a great "fold" card! Great selection of papers and images. Love the fancy fold! I also love that right red with the black...very eye-catching! 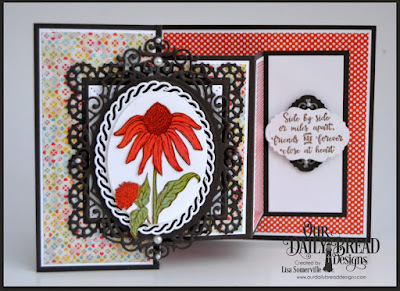 Love, love, love your fancy folds cards, Lisa, and this one is just stunning! 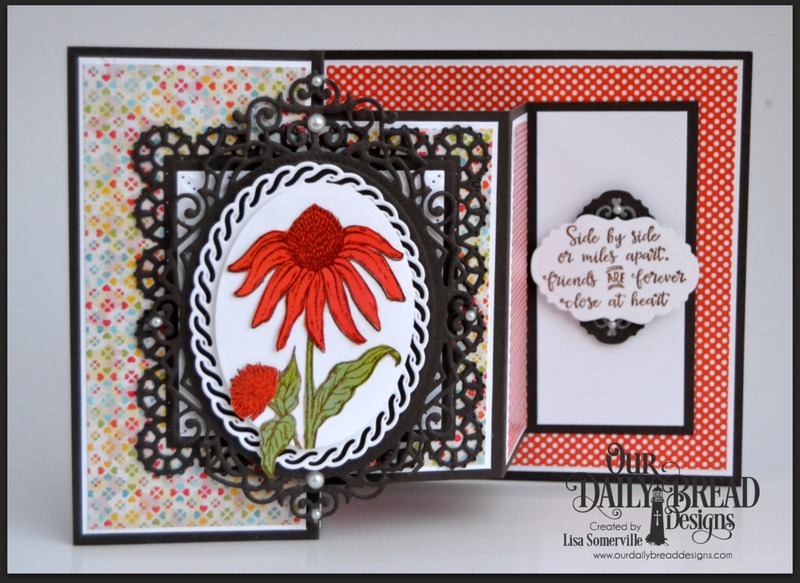 Wonderful double-z card and a beautiful coneflower! Sending hugs from the beach! Great look - the black just pops! Love your Double Z Fold card! Gorgeous flower design and dies, and pretty paper choices! Oh my Lisa! This is gorgeous! Great combination of papers! Very pretty. I like the die cut in black, it makes a statement. Beautiful! Love the interactive card. Using black really makes everything pop. Lovely work. What a beautiful design and I LOVE the colors! Awesome folded card, Lisa! Your attention to details, color coordinating and multiple use and placement of dies is always spot on! Wonderful!